The India Post, Chandigarh, 25th December, 2008 : 4th Junior national Soft tennis Championship Boys/Girls at St. Peter School Sector 37 Chandigarh w.e.f. 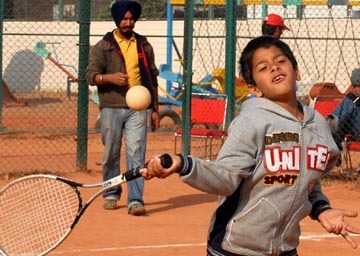 24-28 Dec 2008, orgenized by Chandigarh Amateur Soft tennis Association under the auspices of Amateur Soft tennis Federation of India Recognized by Indian Olympic Association & Ministry of Youth Affairs & Sports and Govt. Of India. Final and Hard line matches of boys section and quarter , Semi & Final matches of girls section will be played tommorrow on 26-12-2008.